When using one of our apps for iPhone and/or iPad, send us an e-mail and inform us about the iOS version you are using, the iPhone or iPad version and which version of the app you have installed. Describe the problem in English where possible. Send the support request via our ticketing system. How do I verify predicted top-of-clouds altitudes? Use the clouds-diagram in our app to see where clouds layers are expected. This is a weather model based prediction that you can more or less verify with infrared cloud-top temperature satellite images. You will find these in our weather app as well. The higher to top-of-clouds, the colder it will be there and the more white these clouds will appear in the satellite image. Over time, you will get an idea of how high clouds are from seeing the satellite image which is like a cloud-top METAR. Then compare this information to what the clouds-diagram will predict and see if the data is consistent. The clouds-diagram predicts cloud layers 24 hrs ahead. Why? The weather model we use to predict cloud layers is only more or less accurate (it is still a model) up to a forecasting period of 24 hours ahead. The model is not accurate in predicting clouds very near to the ground, such as below the first 1500 feet. For that you should compare the outcomes of the clouds-diagram with METAR and TAF data to come to a more balanced view of the potential cloud layers to expect. How do I file a GAR form and submit it? Filing a GAR “General Aviation Report” is mandatory when flying into the United Kingdom. It is best to also file a so-called outbound GAR form when leaving the UK as it might become mandatory soon. The GAR form must be sent a number of hours prior to flight in order to inform the relevant authorities. Now go to the AeroPlus Flightplan app to “User account” settings and got “edit” it and add the e-mail address there in the section “ONLINE GAR” which you used to register your account with “onlinegar.com”. How good is your IFR routing-engine? We teamed up with Autorouter AG and combined their great IFR routing-engine with (1) our own routing-engine, (2) the results from Eurocontrol and (3) static and stored special IFR routes to create the most advanced IFR routing engine. Try it out yourselves and see how easy it is to find valid IFR routes throughout Europe. When do I file a GAR form when flying to the UK? Where do I find the briefing pack and approach plates? You will find an option to generate a briefing pack, get the approach plates or generate a Gramet PDF for your flightplan from within the flightplan app. Go to the flighplan pertaining to the planned flight. In the same menu as where you file the flightplan you will find an option “Briefing pack”, “Gramet” and just below that “Plates”. Use one or all options to generate a briefing pack and/or to generate a PDF with all the approach plates. Check your mailbox a few minutes after requesting it. The briefing pack PDF file with all the relevant information pertaining to your scheduled flight and/or a PDF with the relevant approach plates will be in your mailbox and ready for you to download to your mobile tablet for reference enroute on your next flight or to print them out on paper. Where do I find the IFR auto-routing engine in the app? You can use our IFR auto-routing engine by selecting I-IFR, Z or Y as flightplan type in your flightplan. From there go to the route part and the you will find the search button that will search for valid IFR routes. Make sure all the other parts of your flightplan are filled in such as the requested flight level, the departure and destination airfields, the date and time of departure, etc. Who do I call if I have a question about my flightplan? We created an app that should make it dead-easy to find valid IFR routes and file flightplans. In the app we provide a FAQ section to give you the most important information you need to know. Once you have submitted your flightplan, the app will give you the phone numbers of the respective ARO office(s) responsible for your flightplan, so that you can call them in case that is needed. In the case of an IFR, Z or Y flightplan, the phone number of the Eurocontrol helpdesk is provided, in order that you can give them a call for help. In both cases, you can call Eurocontrol or the resprective ARO office for help once your flightplan is filed and in the system. However, if you have any questions about your planned flight or if you need help with your routing or anything else, drop us a note or give us a call. We are pilots and aviators ourselves and would like to help and support you where we can. In case you are on the apron and need urgent help with your flightplan, we are available 24/7 to support to those who have a valid subscription for the – pro features – and support. You will then find the phone number of AeroPlus OPS along with the phone number of the responsible ARO unit and/or Eurocontrol within the app. Why don’t I get an accepted message on my VFR flightplans? VFR flightplans are handled completely different from IFR flightplans. For IFR flightplans filed with a departure inside the Eurocontrol area, Eurocontrol checks the flightplan and route and then accepts the flightplan and sends us an acknowledgement. This message we then pass on to you in for form of an acceptance message. With VFR flightplan submissions, the flightplan is merely delivered and no follow up is in place in the system. Can I install AeroPlus Tower on a Mac? You can install AeroPlus Tower on a Mac or computer with a modern Windows operating system. Essential is that both operating systems are relatively up-to-date. The software can run on a single PC or Mac in the tower or can be installed in a client-server network environment. Contact us for more details. Related to the use of our Weather app in-flight and through the Iridium GO! or other satellite uplinks. Can I make phone calls from my iPhone or iPad using the Iridium GO! and in combination with my Bluetooth enabled headset? It works with the Bose A20 noise-cancelling headset with Bluetooth option and it might very well work with other Bluetooth-enabled headsets as well. Use the Iridium GO! app for making the phone call. We have reports of pilots using the voice call feature and getting a clear signal, while others report getting a less than perfect voice connection. Can your app download weather in the background? Yes, it can. Our app is specifically designed to be able to continue downloading weather data over the Iridium satellite connection when used in combination with the Iridium GO! device. It will also after download close down the Iridium connection for you. When you move our app to the foreground, the weather data will be available to you. Keep in mind that, in some cases, the download of weather data might be interrupted due to the less than perfect coverage at the moment of the Iridium satellite constellation. Some satellites are defect and Iridium is launching new satellites into orbit to fix this as well as to provide a faster network for data transmissions. If you move your app to the background, you might not notice the interrupt until you move the app from the background to the foreground to find out you still have to download the data once again. Do I need an external antenna to operate the Iridium GO! in my aircraft? It depends on the aircraft you are flying and the view the Iridium GO! built-in antenna has on the sky. If your windscreen area has room for the Iridium GO! device giving its antenna a good view of the sky, you might not have to use an external antenna. Otherwise, there are two external antenna options available where one is a suction cup antenna and the other an external roof antenna. Jet pilots might have to use an external antenna if the windshield is heated and might obstruct that free view of the sky. Does it matter if I download the rain radar data for a whole continent or should I zoom in to only the area of my flight route? In time to download the rain radar overlay over the Iridium connection, it doesn’t really matter that much. You could, for example, first download the rain radar for all of Europe to get an overview of what the weather is doing. Then you could zoom in to show only the area on the map you are interested in. If you then would download the rain radar data again, it will be a little bit more detailed. Does the app support Split-Screen Multitasking on iOS? Yes it does. If your iPad and iOS version supports it, you can run our app side by side next to your navigation software for both to display data on the screen at the same time. How can I prevent other apps from downloading data in the background? On your iPhone or iPad, go to Settings > General > Background App Refresh and turn it off. Now only the foreground app will be allowed to download data over a wifi, satellite or cellular network unless they have been specifically designed to be able to download data in the background. Our app can download weather data in the background, so that you can still look at the enroute chart while at the same time the latest weather is downloaded. In addition, we support split-screen multitasking on the iPad, so that you can display on one part of the screen one app such as the enroute chart with your route and on the other part of the screen our weather app. In addition, the Iridium GO! device will close down the Iridium data call if no activity has ben going on for 2 minutes such a downloading of weather data or making a voice call. How do I download weather data for a specific airport in SAT mode? In SAT mode, the airport data such as the METAR, TAF and weather forecasting data as presented in the Weather and Clouds tabs of the airport will not be dynamically downloaded as you scroll over the map or zoom in or out. What you have to do in SAT mode is to click on the airport icon, then click on the ‘i’ in the airport popup and then press the refresh button which is found in the top right corner. That will then download session the airport weather through your 3G/4G/LTE connection or will initiate a data call to retrieve the airport weather through the Iridium GO! In the SAT mode options submenu in the app, you will find an option to limit the download of airport data to only the METAR and TAF data. If you select that, you will get only the METAR and TAF and the information normally presented in the next two tabs (weather and clouds) will not be downloaded. This option provides for a faster download of the most important weather for an airport and it alternates over slow satellite networks such as through the Iridium GO! If you at the same time also want to download the weather for one or more nearby alternates, then before pressing the refresh button to initiate the download, scroll down to the NEARBY STATIONS section and select the nearby stations for which you also want to download the weather in the same download session. How does the offline map work? When you are normally connected to a WiFi or 3G/4G/LTE network and scroll over the map, the map and airport weather is downloaded automatically and dynamically as you go. However, this dynamic downloading does not work if you are dependent on a slow and expensive satellite uplink. For that reason, when you turn the app into SAT mode, we then rely on an offline worldwide map that is already embedded into the app and we only download airport weather as you specifically request for it to be downloaded. You can download a next zoom level offline map from the same SAT mode menu. The option to download the next zoom level is offered if you go into the SAT mode submenu but don’t turn SAT mode on. Then, at the bottom, you can download a more detailed offline map. The download takes quite long up to 30 minutes but only has to be done once. How is the lightning/strike data provided? In the SAT mode options menu, you can activate the download of lightning data together with, for example, the download of rain radar data or for areas where rain radar is not available the augmented radar. The lightning information is provided to you in near real-time. We buffer the last 5-7 minutes of lightning data on our server for direct delivery to you. The only delay is in the time needed to get the data to you over the Iridium satellite network and when downloaded together with other data such as the rain radar, it might be a few minutes old by the time it is displayed on your iPhone or iPad in the cockpit. The yellow lightning spots you will see on the map will slowly become smaller over time and will disappear completely from your map display on the iPhone or iPad after 30 minutes. If you download new lightning data within that timeframe, the new yellow spots will be added to the map and will be displayed as large yellow spots, while the older yellow spots will still be there but become smaller and smaller before they disappear. It can very well be, that you see lightning strikes at places where you see no rain radar echo at the same place and at the same time. Either the rain radar is not available for that area or the rain radar echo is from a lower altitude while the lightning strike is from higher up in the atmosphere. It is best to combine all the information, so the information from the rain radar (where available) together with the lightning strike data. In case there is no rain radar available, such as in Africa, you can opt to only request the lightning data or to combine it with the augmented radar information. Downloading augmented radar data can take quite some time, so if you need to quickly see where you could expect the thunderstorm activity, then download only the lightning data. 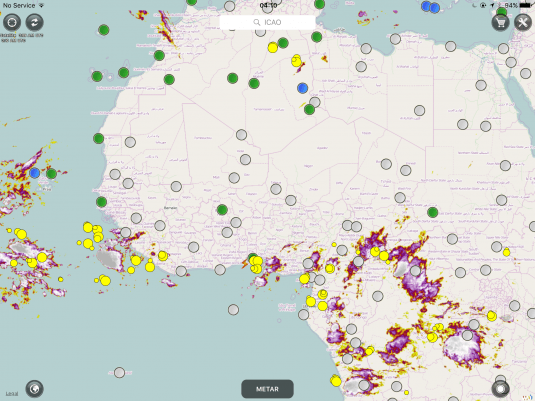 The example, below of thunderstorm activity in West Africa shows you older (smaller) and more current lightning strikes (larger yellow spots) displayed together with augmented radar information. The lightning/strike data is available nearly worldwide. Areas around the poles, the north of Canada and Russia, the southern part of South America, Iceland and all of Greenland are not covered. Is the rain radar data delayed? Most doppler radar stations have two modes: “clear air” mode and “precipitation” mode. In “clean air” mode, the volume scan takes about 10 minutes. Once the radar detects rain, it will switch over to “precipitation mode” and a volume scan will take about 5 minutes. A volume scan consists of a series of 360-degree sweeps, each tilting a little higher than the last sweep. It takes approximately one minute to get the data of the last volume scan delivered to our server and processed by us. If your internet connection if fast, then you might be able to get an update of the radar overlay at an interval of 5-6 minutes. If you are on a slower satellite network, you would have to add 3-5 minutes to this for the radar overlay information to be transmitted to you over the Iridium satellite network. In worst case, the delay might add up to 10-15 minutes, so beware of the possible delay in the radar image. What do the colours in the rain radar overlay represent? In our colour palette, we base our transitions from green to yellow, and yellow to red, on meteorologist feedback, user studies, and the NWS correlations of dBZ to rain rates. We will transition from green to yellow at 35 dBZ, and transition from yellow to red at 55 dBZ. Light drizzle we do not show on our rain radar overlay anymore, so as to not clutter the map with too much data that is not really of use. Also, for the Mix and Snow conditions colour scale, light colours will indicate light precipitation and darker colours will indicate heavier precipitation. Augmented Radar is a mode that is best used in areas without full rain radar (doppler radar) coverage. Take, for example, the African continent. There is no doppler radar coverage here. The Augmented Radar takes, in this case, data from satellites on high altitude clouds and we present the most important build up areas on the map. It is called Augmented radar as we also will display and doppler radar echoes, so we combine doppler radar with satellite imagery to present you with information that can be of good use for you during your flight. Be aware that the satellite data is not real time and could be delayed quite a bit. So use the information to avoid the area and not for strategic weather penetration purposes. It is best to combine this data with lightning/strike data for a better and more complete image of what the weather is doing. Be aware that downloading Augmented Radar imagery might take much longer than just a rain radar overlay over a slow Iridium uplink. Where can I find the timestamp of the rain radar download? There is a tiny timestamp downloaded with the rain radar data. It is displayed in the top left corner and just below the two buttons to centre the map or refresh the data (in SAT mode to download the rain radar data). After you have downloaded the rain radar, you can zoom in on the time stamp. The time stamp shows the moment the rain radar and/or satellite (augmented radar) overlay image was constructed, which might be delayed by several minutes by the time you see it on your tablet display due to having to download it through e.g. a relatively slow Iridium satellite network. Your rain radar overlay does not look the same as that displayed in other solutions/apps. Why? The difference in how rain radar is displayed on the map in a slightly other way from one app to the other has to do with the smoothening of the image. We had this difference in results analysed by professor Jeff Duda of the Center for Analysis and Prediction of Storms of the University of Oklahoma, Iowa State University as, of course, we have been comparing the different sources where to get weather radar from (the Dutch KNMI, MeteoGroup, DWD, Wunderground, etc.) and found they all (not only DWD versus Wunderground) show differences. Here is his analysis when we discussed the differences in results with him. “The differences you are seeing between images for the different apps is related to non-meteorological processes each app is using to display the data. I can tell the apps are using different color tables (i.e., which values of reflectivity correspond to dark green, yellow, orange etc.). It is also likely there is some post-processing occurring after the radar data have been measured and calculated. Some apps perform an extra smoothing to make the raw data more pleasing to the eye. Raw radar data can be very noisy and difficult for un-trained people to read. Smoothing averages out much of that noise and makes the larger-scale picture more clear. There may also be some degree of spatial interpolation to transfer the raw data from its native grid (plan-position indicators on conical surfaces) to the Cartesian grid most likely being displayed on the apps. This requires both horizontal and vertical interpolation, and the scheme used, as well as the final destination grid on which the data are plotted, can impact the final appearance of the data as well. We have taken the approach that light drizzle is not a serious weather hazard and threat to aviation. So, we do now show very light drizzle. When it starts to really rain, we will show the data. In some cases, light rain might not even limit visibility for VFR flights below the cloud ceiling or you might not even notice it on your windshield. Do you have an app for helicopter pilots? Our weather and flightplan filing app is used by a lot of heli-pilots. Especially the feature to add the exact ZZZZ location in our flightplan filing app is appreciated. For a great app specifically designed for helicopter pilots, see http://www.helipaddy.com/. We only provide 24/7 phone support for our flightplan app customers with a current support and – pro features – subscription. The phone support is for those situations where you want to depart and are ready on the apron, but have trouble with your flightplan or our app. However, send us a written support request through the form below or from within the app and we will try to get back to you as soon as possible. Our website is monitored by Sucuri.net and behind their security firewall. It is not a 100% guarantee, but coming close to what we can do to secure our company website from being compromised. Our aviation software offers a lot a features and is highly configurable. We can help you getting started by configuring the system for you. That way you can lead off right away without having to worry about the system setup and configuration. Contact us. We would love to help you. We offer 24/7 phone support to customers with a service agreement, but are always eager to answer your questions by e-mail as soon as we can. Submit a ticket using the form below. Upload a screenshot or another file.